(From left) Stefanie Dugan, Bob Peterson, Shyla Deacon and Marva Herndon at an MPS board candidate forum March 25 at St. Matthew CME church. On April 2, Milwaukee voters will elect five board directors to help oversee the district. And there’s one major issue the candidates disagree on: independent charter schools. WUWM's Education Reporter Emily Files reports. The Milwaukee School Board is about to see a lot of turnover. Five of nine seats are on the ballot in the April 2 election. All the races are contested and only one incumbent is running, which means there will be at least four new faces on the board that governs Wisconsin’s largest school district. The growth of independently-run charter schools is a defining issue in the election. The Milwaukee Teachers’ Education Association (MTEA) announced its school board endorsements at a press conference where leaders also denounced MPS’ contracts with the charter network Carmen Schools of Science and Technology. "One of the key [election] questions is going to be … ending this unsustainable system of private voucher and private charter schools that take life-giving resources, basic resources from students in public schools," said MTEA President Amy Mizialko. MTEA President Amy Mizialko stands with the school board candidates endorsed by the union: Erika Siemsen, Marva Herndon, Sequanna Taylor, Bob Peterson and Megan O'Halloran. The MTEA enendorsed a slate of five candidates who oppose the expansion of independent charter schools under the MPS umbrella. Four of the candidates were recruited by the Wisconsin Working Families Party, which is closely aligned with the teachers' union. "The future of charter schools in general is pretty uncertain," says longtime Milwaukee education observer and Journal Sentinel columnist Alan Borsuk. He says the school board election, combined with proposals from Gov. Tony Evers, could curtail the spread of charter schools in the city. Milwaukee Journal Sentinel education columnist Alan Borsuk talks on 'Lake Effect' about the significance of the upcoming MPS election. Independent charters are publicly funded but privately run with non-unionized staff. "There's the whole argument, are they privateers who are ruining public education or are they innovators who are producing great results?" Borsuk said. MPS has contracts with 17 independent charter schools that enroll about 8,000 students. Some of those schools are the highest-performing in Milwaukee. But critics have multiple complaints. For one, they say charters do not enroll their fair share of special needs students. Critics also contend that charters divert students and funding from traditional MPS schools. "I'm very concerned about what's happening to our public education, with the funds that are being drained in order to support the private charter schools that are out there," said Erika Siemsen, a recently retired Neeskara Elementary teacher who is running against incumbent Wendell Harris in the northwest side District 2 race. 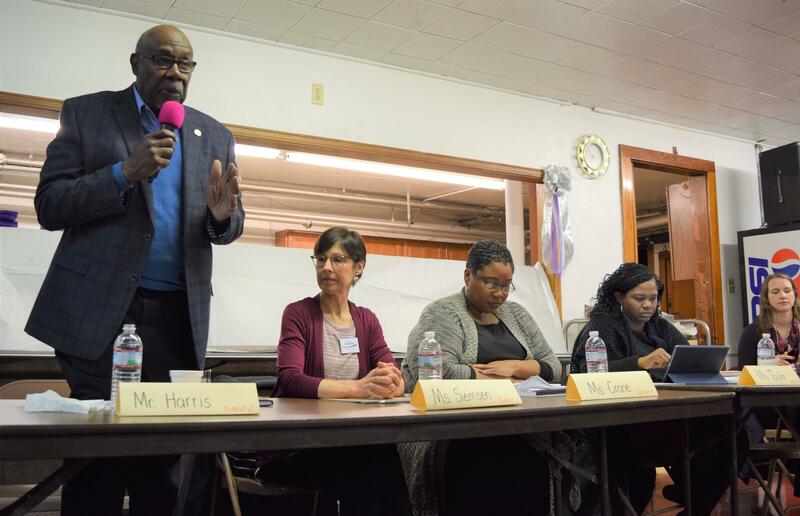 Wendell Harris, Erika Siemsen, Catrina Crane, Sequanna Taylor, and Megan O'Halloran at the March 25 forum. Harris was supported by the MTEA four years ago, but he lost the union's support after he cast a vote in favor of co-locating a Carmen charter school with Pulaski High School. "I'm not of the mindset that public education is under attack to be destroyed," Harris said. The MTEA is backing Siemsen in this election. At a candidate forum on March 25, Harris responded to a question about MTEA influence by warning against electing a union-backed board. "Believe me, I've never faced the kind of wrath anywhere, not even in my days in the street when I was a hustler, that I got from MTEA," Harris said. "So let's be honest about this. We don't need MTEA controlling the board." Harris now has the financial backing of charter school advocates like the Metropolitan Milwaukee Association of Commerce and Howard Fuller. 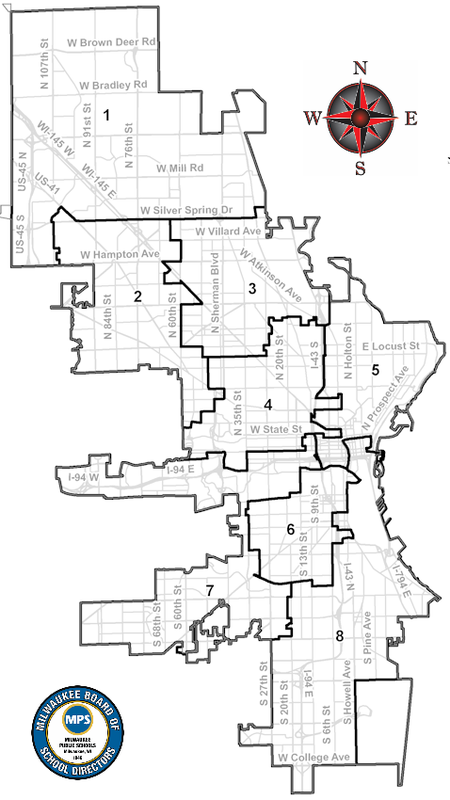 On the ballot April 2: Districts 1, 2, 3, 8 and the citywide seat. Another notable race in this election is for the seat that represents the entire city. After decades in public education as a teacher, union leader and activist Bob Peterson is running for the citywide school board post. "I think there's an opportunity now with the new governor and a growing awareness nationwide with the need to deal with what's called restorative practices and culturally relevant curriculum," Peterson said. Peterson’s opponent is health care professional Stefanie Dugan, who has three children in the district. "I think there's so much right now that needs to change about our public schools," Dugan said. "And I'd like to bring a fresh voice and help move things in a new direction." In District 3, representing parts of the north side, Milwaukee County Supervisor Sequanna Taylor is up against economic development leader Catrina Crane. Shyla Deacon and Marva Herndon are battling for District 1 on the far north side. Deacon is a parent of four MPS students who studied education policy. Herndon is an activist and vocal opponent of charter and voucher schools. In District 8, which includes Bayview, Montessori teacher and advocate Kathryn Gabor is running against community activist Megan O’Halloran. Education columnist Borsuk says whoever is elected will enter a landscape with plenty of challenges. "It's really tough going in the city to make progress on education," Borsuk said. "It's been so long that the needle hasn't moved on the percentage of kids who are rated as proficient or advanced in reading on the state test … there's so many challenges to the kids of the city, and that's really tough for a school to respond to." Updated on April, 8 12 p.m. CT: Final election results affirm union-endorsed Marva Herndon's win in District 1. Preliminary results show union-backed candidates winning four of five open Milwaukee School Board seats in Tuesday's election. The race between Marva Herndon and Shyla Deacon in District 1 is too close to call. On Tuesday, April 2, voters will choose a new justice to sit on the Wisconsin Supreme Court. Appeals Judge Brian Hagedorn, who's supported by conservatives, and Appeals Judge Lisa Neubauer, who's supported by liberals, are competing for the 10-year term. Should the Milwaukee School District embrace or distance itself from charter schools? That is the larger question looming over the MPS board as it weighs whether to renew its contract and building leases with the Carmen Schools of Science and Technology charter network. Carmen’s 1,700 students have better overall test results than the district average. Still, advocates for Milwaukee’s traditional public schools are raising concerns. The future of four Milwaukee charter schools is a little more certain after a school board decision Thursday night. The MPS board voted 5-2 to extend its contract with Carmen Schools of Science and Technology, a local charter network. It serves 1,700 mostly low-income students. Carmen’s two-year contract extension comes with caveats, following significant controversy. Democratic Gov. Tony Evers will call for a freeze on school choice programs and independent charter schools when he introduces his biennial budget proposal this week. Evers isn’t trying to end school choice in Wisconsin. But he does want to hit the brakes. His office provided an outline of his voucher and charter school proposal prior to his budget address, which is scheduled for Thursday. It includes freezing enrollment in Wisconsin’s voucher programs, beginning in fiscal year 2021, and phasing out the newest of the programs.